Pandharpur is a well known pilgrimage town on the banks of Chandrabhaga River in Solāpur district, Maharashtra, India. 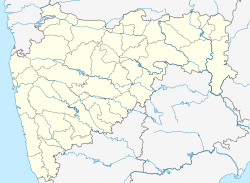 Pandharpur is situated on 17°11' north latitude and 75°11' east longitude in Solapur District. The Vithoba temple attracts about a million Hindu pilgrims during the major yātrā (pilgrimage) in Ashadh (June–July). A small temple of Shri. Vitthal-Rukmini is also located, which is as old as the main Vitthal-Rukmini Mandir, in Isbavi area of Pandharpur known as Wakhari Va Korti Devalayas and also known as Visava mandir. According to the 2011 census of India, Pandharpur had a population of 98,000. Males constituted 52% of the population and females, 48%. 71% of the population was literate; 78% males and 64% females. Marathi is the official and main language of people. 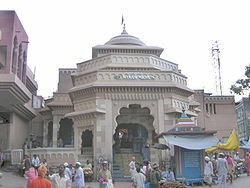 It is a major holy place in Maharashtra and it is also called South Kashi in Maharashtra. It is famous for the Lord Vitthal temple situated on the bank of Bhima river. Bhima river is also known as Chandrabhaga as it takes shape like crescent moon near the town. [clarification needed] There are 4 yatra's (wari- gathering of pilgrims/devotees) per year, of which Ashadhi and Kartiki are the main yatra's. Devotees comes from all over Maharashtra. .They usually come walking hundred of miles,all the way from their hometown. ^ Rice, Lewis. Mysore and Coorg : A gazetteer compiled for the government of India. Bangalore: Mysore Government Press. p. 460.